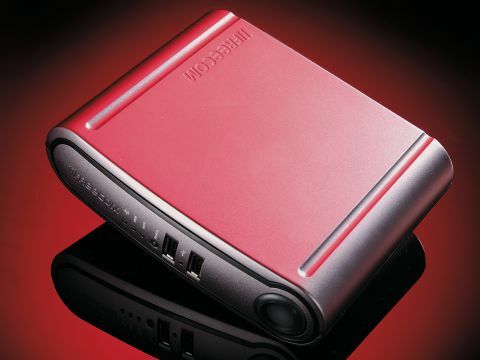 For such a compact little drive, Freecom's new Storage Gateway packs a mighty punch. The styling and finish are excellent, but the most obvious difference between this drive and its main rivals is the antenna that sticks up from the back. Sure enough, the WLAN version of the Storage Gateway offers full 802.11g (54Mbps) wireless networking thanks to its built-in router, as well as being backwards compatible with 11Mbps "b" wireless standard. On top of that there are three RJ-45 ports for wired Ethernet connection. These aren't Gigabit compatible, only going up to 100Mbps, but that's still fast enough for most home and small business users. Connection options go further still, with four USB2 ports (two on the front and two on the back), plus a SATA port for attaching a second external drive - slightly surprising considering the built-in drive is an EIDE hard disk. The final socket is labelled WAN and is used for connecting a DSL modem, after which you can share your broadband connection through all the wired or wirelessly connected PCs on your network. At this point you have to wonder why Freecom didn't build a modem into the Storage Gateway as well, just to complete its all-singing, all-dancing repertoire. Quiet and efficient in use, the Freecom does many tricks. As well as acting as a regular network file server, you can also use it as a secure FTP server over the Internet, a Web server, email server, print server, back-up server and AV server for your audio and video files. There's also a built-in firewall, cross-platform compatibility for Windows, Mac, Unix and Linux, plus two licences for the bundled Acronis TrueImage back-up software. It's everything you could want for the home or small office.